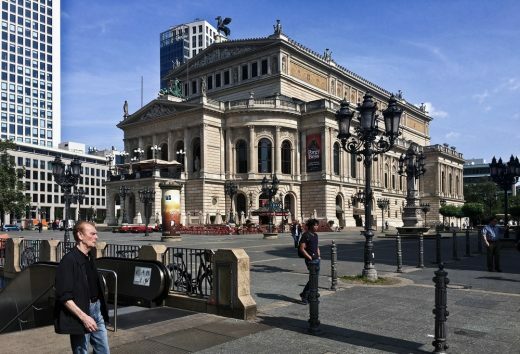 The „Alte Oper“ in Frankfurt is one of the world´s leading concert halls. Each year 450,000 people come to visit more than 400 concerts performed by internationally renowned artists of the classical music, jazz and the entertainment sector. The „Alte Oper“ intends to convert one of its multifunctional used foyers into a central and adjustable place of encounter, conversation and interchange. The emerging office of the architect Fabian A. Wagner succeeded in an international competition against highly challenging participants. Zaha Hadid Architects took second place. The design by Buero Wagner implements the functional requirements within the scope of a room in the room concept. It has the shape of a valuable casket with a golden surface. The form of this new place derives from the existing support structure. The newly created interspaces and inside areas can be adjusted easily since a spatial, organizational and acoustic separation through massive revolving doors allows a wide range of possibilities for separation or conclusion of space. In this way, the architects implemented the required functions in a simple and pragmatic way.The atmosphere produced in this design results from the dialog with the existing architecture. The appearance is valuable and warm and it is suitable for different audiences. In this way the design blends highly in the existing monument protected building fabric. Border and transition zones are not changed. The golden, yet plain structure inside the black interspaces correlates also with the “Alte Oper” A LED matrix is provided on the ceiling of the black interspaces.It can be programmed with individual features such as interaction with the visitors or the display of graphics or writings and also serves for lighting the space. In a very detailed, creative and convincing manner, the architects of Buero Wagner managed to solve the task of furnishing. This also applies to the use of digital media.